The NEW C-1540 direct drive cone crusher is the latest addition to the Terex|Finlay range of tracked mobile cone crushers. 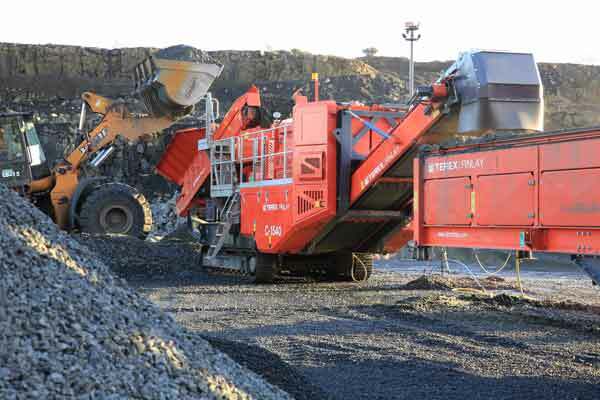 This machine has been developed to satisfy the requirements for any aggregates producer or contract crusher looking for a high output capacity machine that provides large reduction ratios and an excellent cubical shape in the surface ore mining and aggregate industries. This aggressive machine incorporates the proven Terex 1000 cone crusher that can accept an all in feed and features direct variable speed clutch drive and “on the fly” hydraulic closed side setting (CSS) adjustment. A key feature of the chamber is an overload protection system with automatic reset that permits uncrushable material to pass through and be discharged efficiently from the machine. The feed-in box to the chamber is fitted with an ultrasonic level sensor that is calibrated to the feeder to ensure that the chamber is consistently choke-fed for maximizing throughput and minimizing crusher wear. These features all combine to give operators an efficient and aggressive crushing action, high performance and low cost per ton. The standard 5m³ (6.5yd³) hopper/feeder on the plant has been designed with a low feed-in height so that the machine can be fed directly either by primary crusher, excavator or shovel. A key feature of the hopper is the standard automated metal detection and a purge system that has been designed to protect the cone chamber and reduce downtime by removing metal contaminants via the purge chute. “We are continually communicating with our customers through several forums and the introduction of this machine is a direct result of this ongoing process. This exciting new model builds upon the success of our current C-1540 prescreen model, C-1545/C-1545P and C-1554 cone crushers. The heart of this new model is the Terex TC-1000 cone crusher which is world-renowned for its flexibility, versatility and outstanding performance. The functionality and serviceability of the machine where key design criteria of the plant from the outset and we have received only positive feedback on these characteristics. With the introduction of this new model we now have one of the most comprehensive range of tracked cone crushers in the market place.” remarked Alan Witherow, Terex|Finlay Product Development Manager. •	Fully hydraulic closed side setting (CSS) with electronic monitoring system. •	Fuel efficient direct drive transmission via a clutch. •	Hydraulic Tramp Relief System with automatic reset protects the chamber and minimizes downtime. •	Metal detection system on feed belt with ‘auto-stop’ protects the cone from tramp metal and the purge system removes contaminants from the machine.